Welcome to Down On The Street, where we admire old vehicles found parked on the streets of the Island That Rust Forgot: Alameda, California. Though we've seen many of Alameda's first-generation Mustangs (a '65, a '66, another '66, a '68, a '69, and a '73) and even a Mustang II, the Fox Mustang hasn't been well represented here. In fact, we've only had this beater '86… until now. Yes, parked just a block or so from the '89 Ferrari Mondial T, here's a very nice example of the rare Mustang SVO. In '86, the SVO came with a 200-horsepower 2.3 liter "Pinto" four-banger, essentially the intercooled version of the engine used in the Merkur XR4Ti. Speaking of the XR4Ti, check out that wing! Even though the turbo 2.3 made the same horsepower as the 5.0 V8 and the SVO came with all manner of cool brake and suspension goodies, sales were miserable. Why? Price tag on the V8 Mustang GT for '86: $10,691. 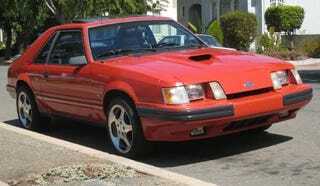 Price of the '86 SVO Mustang: $15,272. Sure, the SVO outperformed the GT, but that didn't take away enough of the 50% price difference's sting to convince buyers. Plus, we were locked in the final battle with the Evil Empire, and a real American in 1986 would sooner drive a ZIS 112 than a four-banger, no matter how hot. Nowadays, with the ready availability of aftermarket turbocharging hardware and engine computer mods, there's no telling how much power an SVO has. This one has a fuel pressure gauge, which suggests "more than 200" is a likely horsepower number.